My Favourite Kitchen Gadget Is My Mini Oven, It Sits On The Worktop & Does Exactly The Same As A Conventional Oven But On The Worktop! I think my favourite gadget is my garlic press. It's certainly the most used! I love my Senseo Coffee Machine. My most used gadget recently has been my Halo+ Actifry. It makes really nice chips. my halogen oven is my favourite kitchen gadget! my steamer - not really a gadget but wouldn't be without it! My electric whisk, they're a really cheap set from a supermarket but they're so handy! My kettle- have to have a brew in the morning! My electric steamer, its used everyday!! My pasta machine - couldn't live without it! Potato peeler - its the most used one. Like my Tassimo - still using it 2+ years in. I've just recently bought myself a stand mixer, and it is my favourite thing ever for baking! My Blendtec Blender. Its a work horse in my kitchen does everything for smoothies to ice cream and pizza bases, love it! Potato peeler. It would take soooo long with just a knife! It has to be my coffee maker, it powers my day most days! I think it must be my one cup water boiler for a cuppa! My favourite is the slow cooker. I love my bread maker - you cannot beat fresh bread! My favorite kitchen gadget is my slow cooker. It's starting to get a lot of use now that it's colder out. rather boring,but the microwave - so useful when I've forgotten to defrost something! My slow cooker as it's so easy to use. My lovely Kenny (Kenwood chef) is my best kitchen appliance - I use it daily - even peels my potatoes! my slow cooker love it! Electric can opener - I hate the manual ones! My favourite kitchen gadget is my microwave. So handy when I'm in a rush. My Actifry is my favourite kitchen gadget! my slow cooker. we'd starve without it. My trusty old slow cooker! My electric hand whisk, making cakes and whipping cream a doddle. Slow Cooker it is! Thanks for the Giveaway! May the best win! My Kenwood Chef - its over 40 years old but I love it. My stand mixer - prevents icing sugar showers!! My favourite kitchen gadget is my juicer. I love my Tagine. Cooks meat so tender! The blender, great for making delicious dips! Also my kettle we go through a lot of tea and coffee here!! Mine has to be my blender! 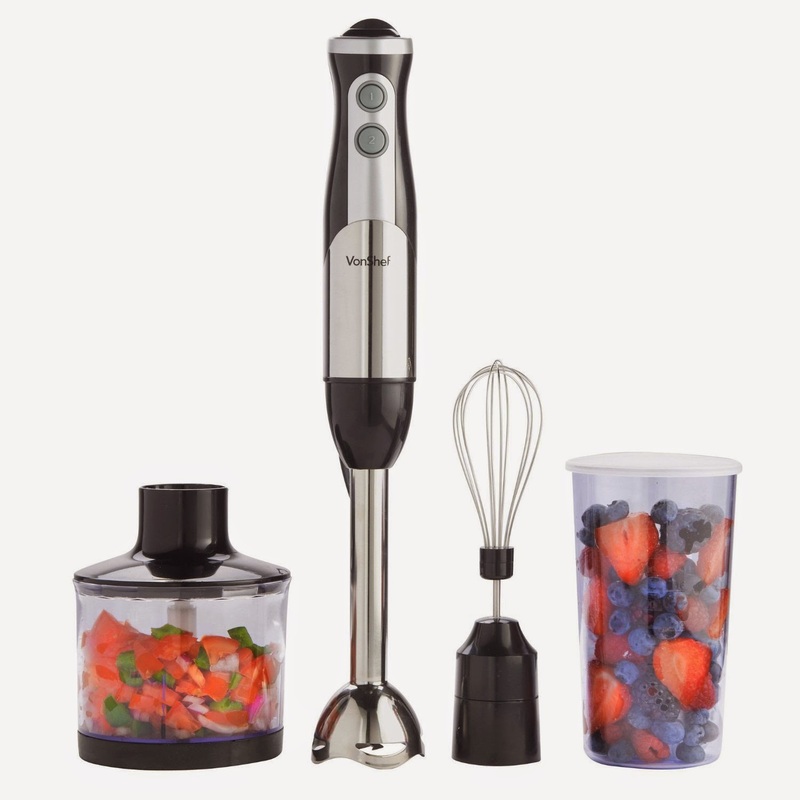 It's perfect for chopping vegetables, pureeing frozen fruit, making smoothies and so many other things! My blender! I love it especially for healthy juices!